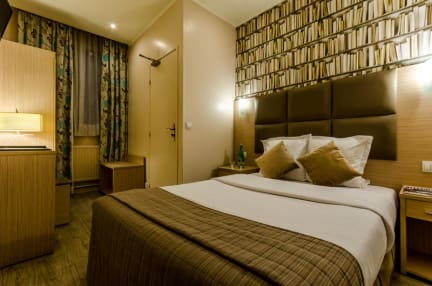 Hotel Riviera v Paříž, Francie: Zarezervujte nyní! 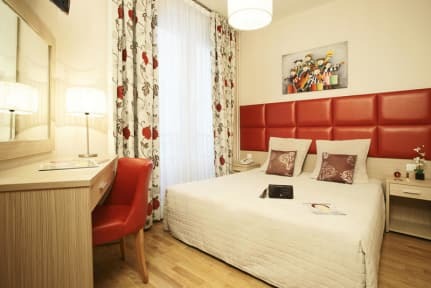 Hotel Riviera is a 3-star hotel well-located in Paris, between Opera and Sacré Coeur Basilica. The hotel is located in a quiet area. At the Riviera Hotel, you will be able to enjoy the comfortable facilities and services in our friendly and lovely decorated atmosphere. The property offers you a continental breakfast each morning in the dining area or in your own room, between 7 a.m. and 10 a.m. for more information, please do not hesitate to contact the property. Hotel Riviera is perfectly located in the 9th arrondissement of Paris, perfect location for those who want to discover the richness of Paris. You will be able to visit the majestic Sacré Coeur, the Dali museum, the theatre of Montmartre, the Moulin Rouge and the Amelie Poulain coffee shop; don't forget to also visit the famous Galleries Lafayette and the Opera Garnier. The property is located in a quiet area, surrounded by many small Bistros and Gastronomic Boutiques. Hotel Riviera offers a wide range of accommodation, from single room to family room for 4 people, they all have a private bath. The hotel has 38 comfortable and modern rooms equipped with bathroom, Internet, Telephone and TV. All rooms were renovated in 2003. Check-out time is 12 pm. Payment types accepted at this property: cash, credit card and debit card. Taxes not included - Local occupancy tax 1.65 euros per person per night. Breakfast not included. Extra-cost: 6 euros per person per day. For more information, please do not hesitate to contact the property.